Lufthansa First Class Available in Advance!!! I am seeing space on Vancouver – Munich and Montreal – Munich in Lufthansa First Class wide OPEN for First Class awards through the end of the schedule!!! There may be other flights, but at this moment with the few routes I’ve checked these seem to be the only routes that have first class award space more than 14 days out. I know for sure that they are bookable with Aeroplan and Lifemiles (I just made a booking), and appear on the ANA Tool as well. So theoretically this should be availble with United and other Star Alliance programs, with the exception of US Airways. I called them just now and they were not able to see the seats. 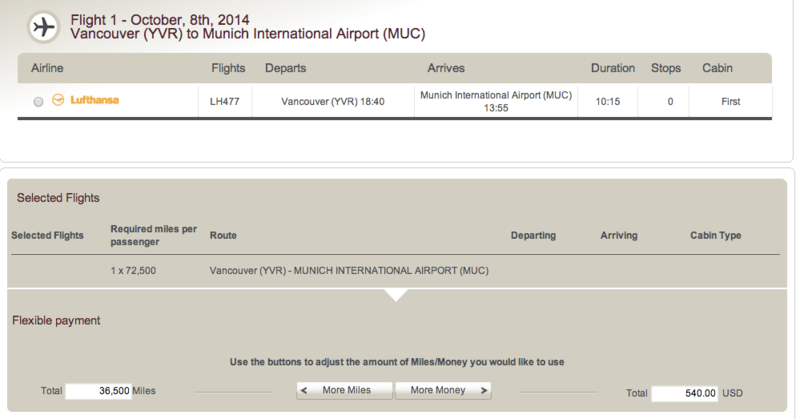 The YVR-MUC flight is seasonal, so I believe it starts March 30th and ends late October/November. But either way there’s definitely award space available during the summer peak months, so I’d suggest getting on this as fast as you can. It seems to me that there tends to be a lot better space on the YVR-MUC flight than the MUC-YVR one. The Montreal – Munich is also a goldmine. I’m seeing two seats during Christmas peak season!! There are also a tiny handful of dates that have three seats. I’d suggest you comb through the ANA Tool to find them. Aeroplan does levy fuel surcharge on Lufthansa, so you’ll be seeing $484 of taxes and fees, $438 of which is fuel surcharge. Keep in mind that AMEX Membership Rewards in the US AND Canada have Aeroplan as a transfer partner. Both are instant, so this might be the easiest way. As well, if you’re booking a roundtrip (which is double a one-way) you are allowed two stopovers as well, so there’s a lot of flexibility. As well, you can combine these with other flights for a mini-RTW as well, depending on where you want to go. I saw earlier that the lifemiles site was showing the same first class availability as on the ANA Tool. If you already have miles, this is a decent opportunity with no fuel surcharges. Currently there’s no sale on lifemiles, but if you do have a balance you can purchase 50% of the remaining mile required at 1.5 cents (avoid the 40/60 split as that’s a poorer ratio to purchase). This means if you have around 36,500 miles, then you can pay $540 to purchase the remaining amount of miles to ticket at booking. Unfortunately, your United miles are devalued as of 2/1 so this means that an award like this would be in the partner chart and would cost 110,000 miles one-way. Again however there are no fuel surcharges and you can tack on a flight to Asia on Thai/ANA/Asiana/Air China First Class to Japan for the same number of miles. It should be available if you call in as it seems that United.com is not displaying the space. Happy Booking! If you have any questions I’ll try and answer them in the comments. Do u have a list of route that has F product? Both YVR and YUL to MUC have first class. I mean route that are not ex NA. Most North American/international destinations have F. There are very few that don’t. You can see whether your route has F or not if you look at a sample paid booking on lh.com. Not showing at all on United. Do you have a different experience? You have to call in to see the space. What tools you use to check award travel? ANA, Expertflyer, BA.com, and KVS.